Trailing 21-19, Dylan Smiths’ scored the dramatic try, which was converted, as the final whistle blew. Buxton have been working hard on fitness and tactics in the run up to this season and it told in the closing stages of this match. At the kick-off Amber Valley secured possession and Buxton, who were missing a couple of key players, missed several tackles and conceded an easy try within the first minute. Coach Bob Tann brought his players together for some early advice and Buxton rallied and defended well but still conceded two more tries to what was looking like a more superior side. At half-time Amber Valley lost a player to injury, but were still 21-0 up despite Buxton dominating them in the scrums. Buxton were given some more encouragement from their coach leaving them in no doubt what was needed to salvage some respect from the game. 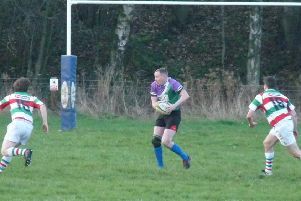 Captain Cameron Moss, returning from injury, lead the charge from the front and scored three tries in succession with two converted to bring the score back to 21-19. In the dying minutes Buxton were still looking strong as their fitness began to pay off. Amber Valley threatened to score, but a beautiful sequence of play in defence lead Buxton to turn over Amber Valley. A pass from Harry Rumbelow making its way into Smith’s hands who ran the length of the pitch to score under the posts. Dan Hunter converted the try and the final whistle blew.